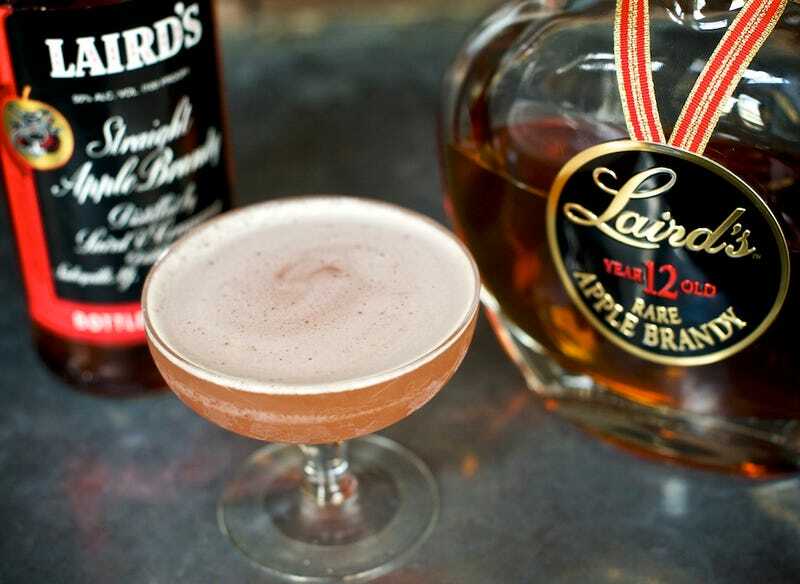 Once upon a time, apple cocktails had a great reputation. Or better put, they had a great reputation until the late 1990s. That's when DeKuyper launched the awful Jolly-Rancher-like liqueur Pucker. (Before Pucker, DeKuyper was best known for its "Hot Damn!" cinnamon schnapps; it should have stopped while it was behind.) Clearly targeted at college-age binge drinkers, the line featured silly flavors such as Watermelon and Grape. Somehow, though, Sour Apple Pucker cut through all the rest and became a hit, ushering in a new era of idiotic drinks and inspiring a slew of imitators. Shortly thereafter, cocktail menus were overrun by Apple Martinis, Washington Apple shots and the infamous Asian Pear Mojito, which was neither Asian nor contained anything resembling a pear. And so, in contemporary society, the 'A' in apple cocktails might as well be a scarlet letter, because of the shame inflicted by this low-proof mixture of grain alcohol, imitation apple flavoring, green dye and citric acid. But I say Apple's honor deserves to be restored. After all, America was built on the backs of real apples, and real booze made from them—especially a brandy called Applejack. Applejack is something of a forgotten spirit, originally made by "jacking" apples—laugh if you must—a primitive form of distillation. Its history dates back to Colonial times, when apples were plentiful because the orchards they came from didn't require a plow (and therefore, needed less work and resources). Our forefathers could basically do three things with all of those apples: (1) eat them for sustenance; (2) drink them as juice for hydration; or (3) press and ferment them for an alcoholic cider. Naturally, many of them selected option number three—a preference they further enhanced over the winter by leaving the cider outside to freeze. Given alcohol's lower freezing point than water, the water in that fermented juice would turn to ice, which was later removed from the barrel where it froze. The result was a higher-proof apple liquor of sorts. As Applejack became more popular in the United States, in 1780 the peasant method (press, ferment, freeze) gave way to a more standard distillation process led by Laird & Company of New Jersey, which has been making Applejack ever since (except for that unfortunate interlude known as Prohibition). Of the many classic recipes that call for Applejack—e.g., the Corpse Reviver #1, Pink Lady and Apple Blow Fizz—I recommend the Jack Rose whenever someone asks me for an apple-flavored cocktail. Maybe it comes from a place of fear, but I tend to reach for something that will satisfy those looking for an Apple Martini while still eschewing laboratory-created flavors. The Jack Rose does exactly that—courtesy of the apple flavors from the Applejack, sourness from the fresh lime juice and fruit taste from the pomegranate grenadine. So that stupid Pucker can stay far away and allow Applejack to win back its good name. Shake ingredients with ice until well chilled. Strain into a chilled cocktail glass. Do not garnish.